This being Valentine month, here is a light-hearted look at how herbs can also restore the romance in our lives. Besides their many practical uses, herbs also work in the realm of the emotions. One thinks of the soothing, calming herbs, those that deal with depression or lift the spirits. All these are herbs for the heart. In ancient times herbs were mixed into love potions, lavender was put under the mattress to ensure marital passion, young lovers carried rosemary as a token of their faithfulness and lemon balm was credited with being able to cure a broken heart. We are not as superstitious or gullible these days, especially about love potions, but one can understand how herbs that promote a sense of well being were once regarded as the herbs of love. Happy, positive people are far more likely to find love than those who are grouchy and depressed. Lavender (Lavandula species) is the number one romantic herb. It is a complete package; a plant that is delicious to smell, taste, feel and see. It is said to promote passion, harmony, friendship and cooperation with a lover, probably because its key action is as a carminative that acts on the nervous system. 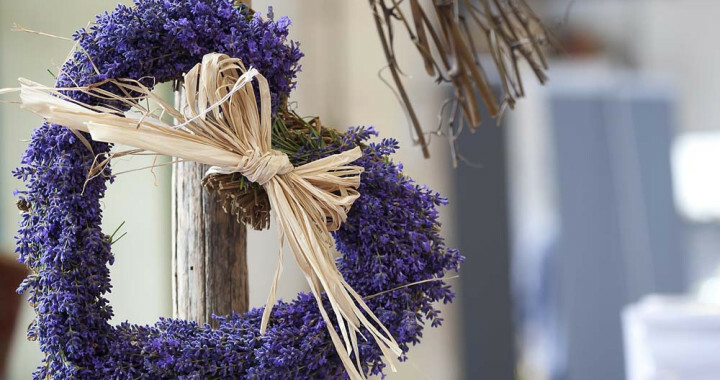 Lavender lends itself to romantic gestures; a posy of lavender with breakfast in bed, a lavender and candlelight bath, heart shaped lavender cookies, or a massage with lavender scented massage cream. Bring romance into the garden by planting lavender on either side of a pathway, so that you brush against it as you walk. The most popular and best performing lavender is the South African bred Lavandula intermedia “Margaret Roberts’. It seems to be tougher and longer lasting that all the other lavenders, especially when grown on the highveld. “Margaret Roberts” lavender grows into a huge 1.5m high and wide bush that never stops flowering. Although the individual flowers are not showy, the mass of blooms that it produces makes this plant a showstopper. Rosemary (Rosmarinus officinalis) represents love and faithfulness and it is valued for raising the spirits (and improving circulation) which may explain why some cultures have used this herb as an aphrodisiac! Inhale fresh rosemary and you can understand why it opens up the heart. It is an energising herb, full of joie de vivre. Not surprising that it became an emblem of fidelity for lovers, twined into bridal bouquets and given to guests at the wedding. In the spirit of celebration and weddings, try this rosemary, vodka and lemon cocktail. In a cocktail shaker put a sprig of rosemary, fill with ice and put in one or two tots of vodka, a tot of lemon juice, a tot of limoncello (the Italian aperitif) or one pulped peeled lime, and 1½ to 2 dessertspoons of caster sugar. Shake vigorously until the sugar is dissolved. Strain the mixture into the martini glass. The proportions can be adjusted to taste. It is delicious and refreshing. Rosemary, like lavender, needs full sun, soil that drains well and space to grow. There is the traditional ‘McConnell’s Blue’ , the upright ‘Tuscany Blue’, creeping rosemary, the groundcover rosemary ‘Irene’ as well as the upright Pink rosemary and ‘Heinz white’. Peppermint (Mentha piperita) is another herb that lifts the spirits. The essential oil is a stimulant that refreshes the spirit and mind, increasing mental agility and alleviating mental fatigue. Use peppermint as an excuse to introduce some decadence into your life, with this chocolate peppermint slice. Make a base using a packet of crushed tennis biscuits, mixed with 125g melted butter and 1 tbs cocoa. Put in a dish and refrigerate. Make a peppermint cream filling with 1 cup of icing sugar, 2 tbs softened butter, 2 tbs cream lightly whipped and 2 tsp peppermint essence. Add in some green colouring. Spread over the base and set in the fridge. When set, melt some dark chocolate and drizzle it over the top. Keep refrigerated. Parsley (Petroselinum crispum) doesn’t come to mind as a romantic herb but it does sweeten the breath, especially after eating garlic which is a real passion killer! Parsley works best if you eat a sprig or two immediately after consuming the garlic. It has a long folk history of increasing female libido although modern research has found it to be helpful to women by stimulating delayed menstruation and in relieving menstrual pain. Everyone however, benefits from a daily serving of fresh parsley because the leaves are very nutritious, with a high vitamin and mineral content. Parsley grows best in full sun and likes deep, fertile soil that drains well. The common parsley is the moss curled parsley but many cooks prefer Italian parsley, which is the flat leaf parsley that stands up better to cooking and has more flavour. Anise (Pimpinella anisum) is another breath sweetener that helps with digestion if one chews a few seeds after a rich meal. Does it “stirreth up bodily lust” as some writers claim? Yes it does, according to the Encyclopaedia of Medicinal Plants which says that the volatile oil (anethole) has an observed oestrogenic effect which may substantiate the herb’s use as a stimulant of sexual drive. Anise is grown primarily for its seeds which are quickly produced. It is an attractive annual with feathery leaves and lacy flowers that can be picked for the vase. It grows easily in any soil, needs full sun and regular watering. Lemon Balm (Melissa officinalis) is a healing herb because where there is love there is also, alas, the possibility of a broken heart. An infusion or tea made from Lemon balm helps reduce anxiety, mild depression and restlessness. It is a low growing perennial that likes moist, fertile soil and can take light shade. The leaves attract bees and have a lovely lemon fragrance. Posted in Aromatics and tagged fragrance, herbs, romance.